There are so many amazing Châteaux and Castles in the Czech Republic that you will definitely feel like being in some wonderland. The Czech Republic is a country filled with fairy tale castles, châteaux, and palaces. The majority of them are well-maintained and, moreover, they are usually surrounded by forests or amazing gardens, fountains as well as sculptures. Some of them serve as museums, or as great places for a wedding ceremony, while others offer accommodation, great food, golf course and more. 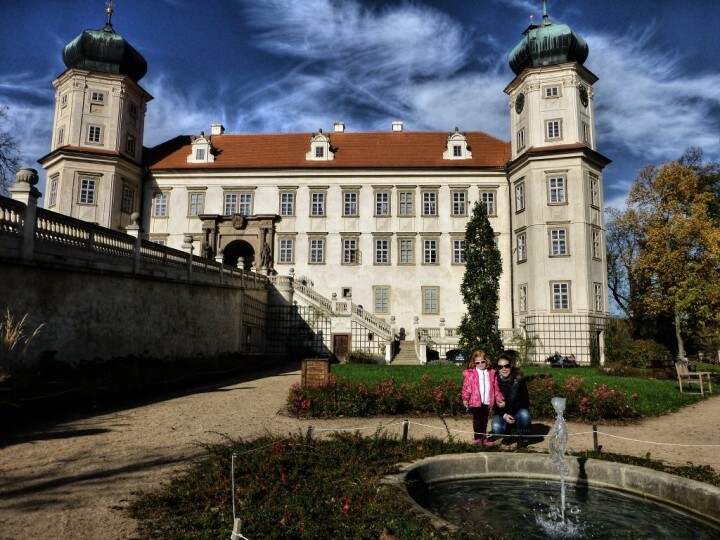 Here I prepared a list of the Top Châteaux and Castles in the Czech Republic you should visit. I know it is a long list, but they all are really amazing! There is probably no better place to start with than Castle Hluboká. This fairy tale castle is situated in the southern part of the country and is amazingly beautiful not only from outside but also its interiors worth a visit. It is surrounded by a large park so you can easily spend here a whole day. Castle Hluboká is also a great place for your wedding. This national cultural monument is open all year round except Mondays and the family ticket costs 400,-Kč (around 15,-EUR). Who wouldn’t know this great castle surrounded by great forests? 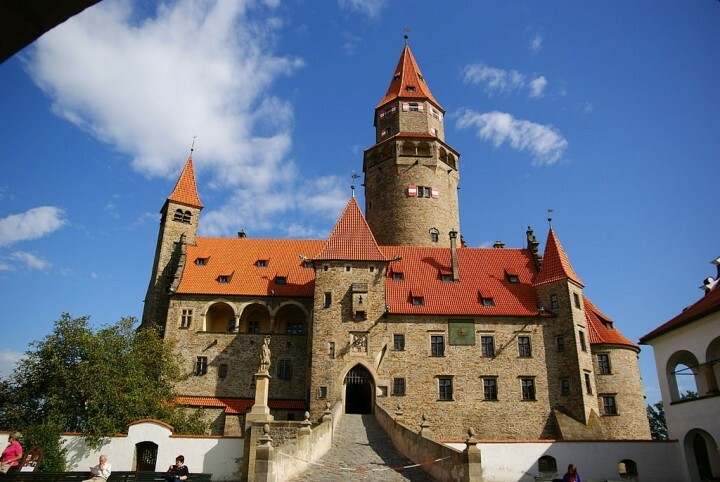 Karlštejn Castle is a must visit place among all Prague visitors as it is just 30 kilometres from the Czech capital. The best way on how to get there is by train and once there, try to get to the castle via different (not usual) way with a great viewpoint of the castle. Ask for the info at the local information centre. Lednice Chateau is a Czech version of Palace of Versailles and is surrounded by the largest English park in the country featured with large pond, greenhouses or unique 62 meters tall minaret. The complex is a part of UNESCO World Heritage Sites since 1996. 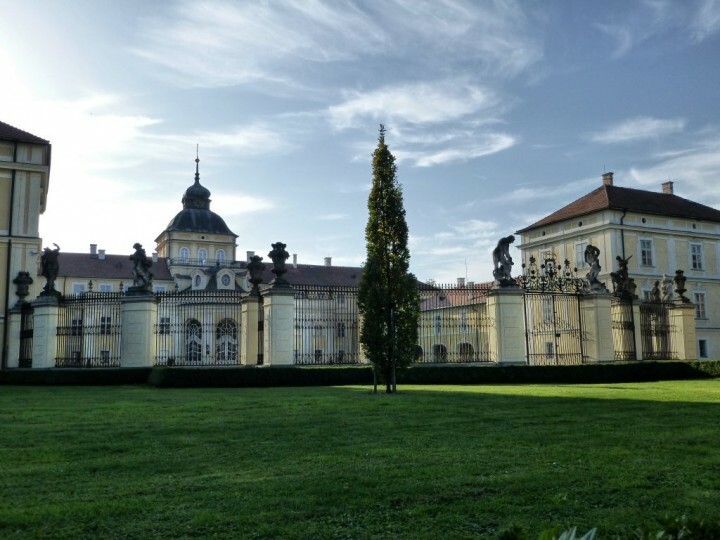 Only 8 kilometres from Lednice Chateau you have to visit another beautiful palace from 12th century, Valtice Chateau. They both form a complex which is inscribed in the UNESCO World Heritage List as Lednice–Valtice Cultural Landscape. 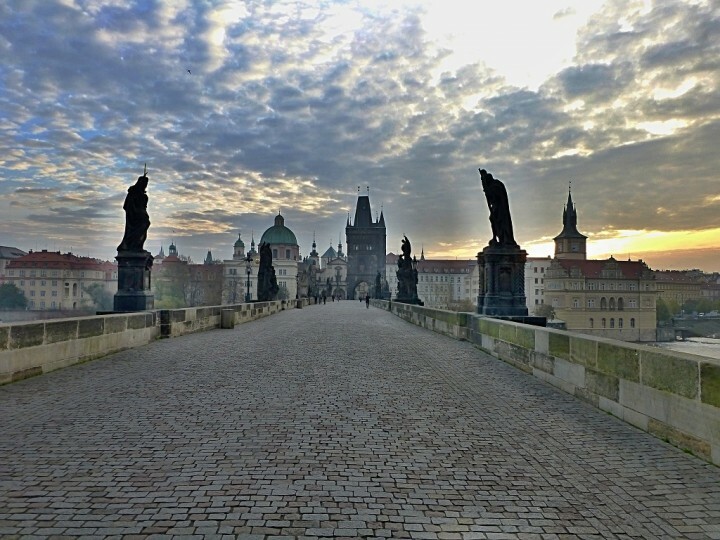 The first time visitors to the Czech Republic usually go to its capital city, Prague. And all of them then climb up to the Prague castle which makes it the most visited attraction in the country at all. It is one of the largest castle complexes in the world and is open all year round. 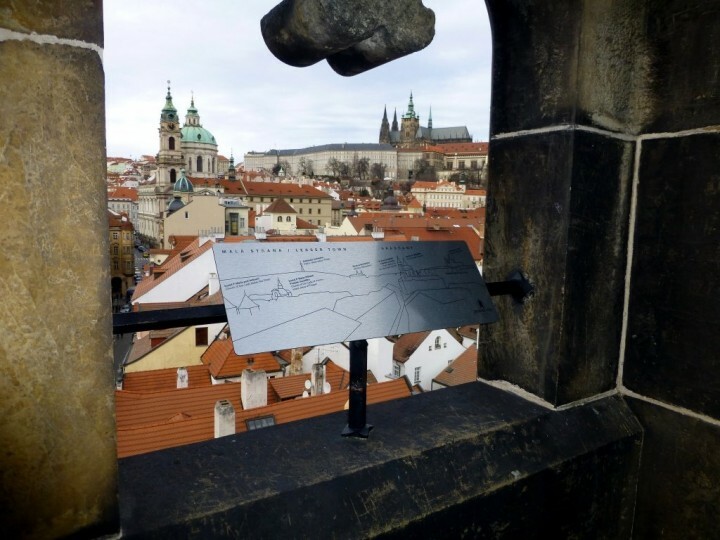 From here you can also enjoy some of the best views of Prague. 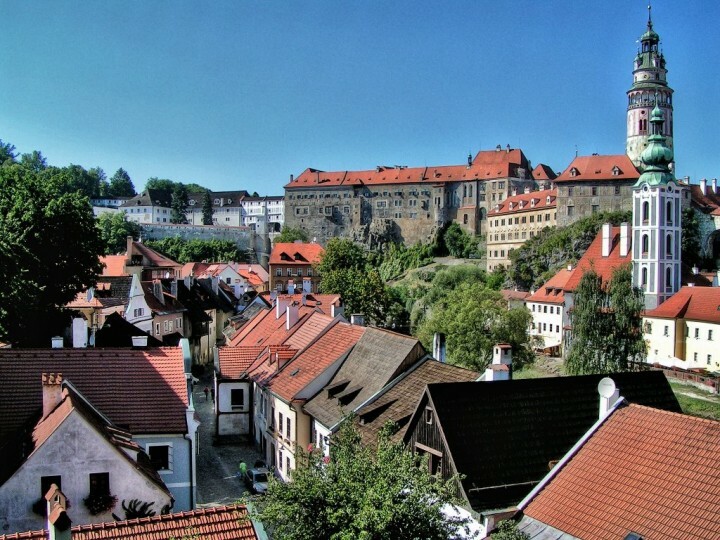 Český Krumlov Castle is right after Prague castle the 2nd most visited castle in the country. 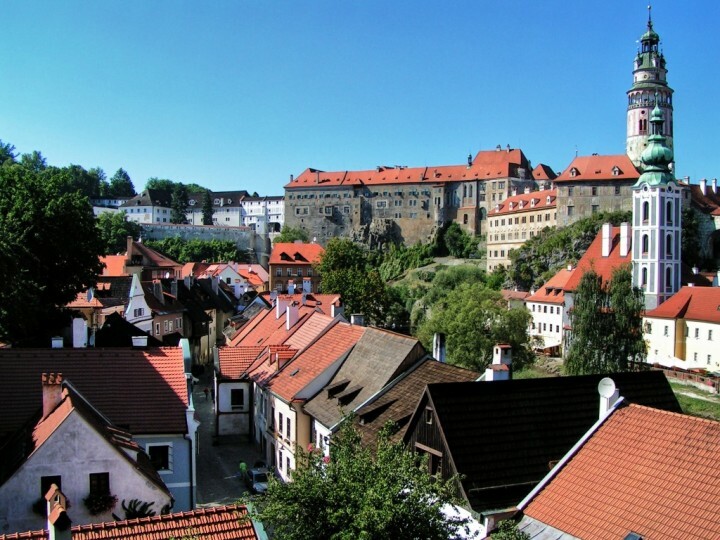 It is another UNESCO Site in the Czech Republic and is towering on the hill above the romantic and beautiful town of Český Krumlov. Gothic Sychrov Castle served as the residence of the French family of Rohan and has been a place of several Czech fairy-tales movies so far. Now you can go on day or nighttime tours, see exciting falconry displays or concerts. 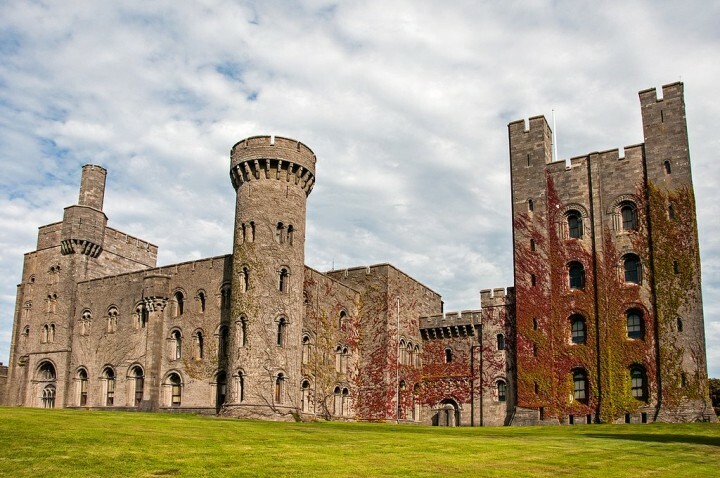 The castle became popular for the Scottish games that take place here every year in August. Chateau Dobříš is another nice Chateau with a large French garden, fountain, and sculptures. Adjacent to this castle is even larger English garden with a pond which attracts lots of visitors for pleasant walks and relax in the shadows of the trees. 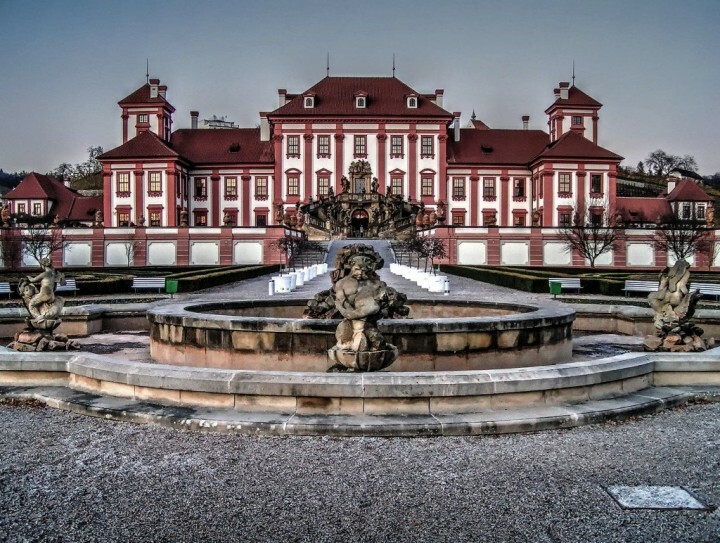 Chateau Loučeň is a unique castle not only in the Czech Republic but also in Europe. Its gardens are home to the first Labyrintarium in the country and the only one in Europe. Children will surely be happy once you take them here. The weddings, castle tours and relaxing are just a few more things you can do here. A very nice place full of peace and tranquillity can be found in Mníšek Pod Brdy, a small town south of Prague. 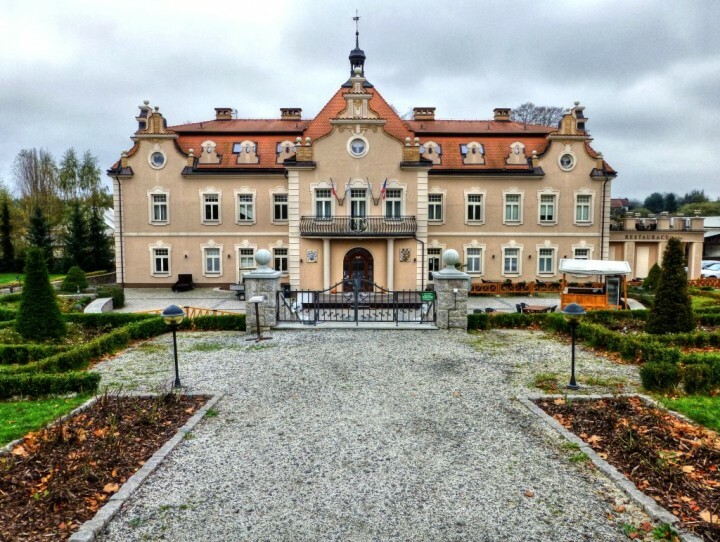 Mníšek pod Brdy Chateau was built in the 14th century and boasts nice garden with fountain. You can visit its halls and rooms as well as the nice courtyard. 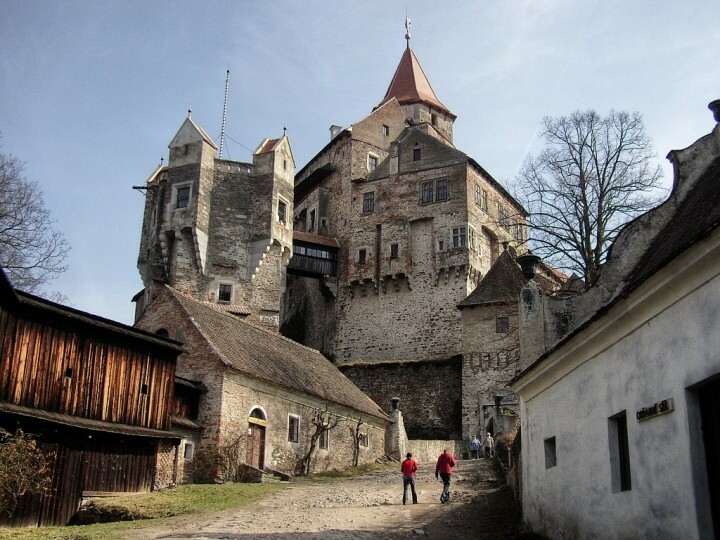 Bouzov Castle is a popular tourist destination and offers costumed as well as evening tours through its rooms which are fully furnished and equipped. It was built in the 14th century and its most valuable part is a neo-Gothic chapel and Gothic altar. Tour of the Hořovice Chateau can be enjoyed together with a pleasant walk along the park featuring several sculptures made by Matthias Braun. The Chateau was built in the 17th century and once you make your first step into the garden you will be transferred back to this century! If you are looking for some golf course nestled in the beautiful castle garden then Štiřín Chateau would be the best place to go. Located just a few kilometres from Prague borders it can be a great day trip to go from Czech capital. This Baroque chateau was built in the 18th century and later rebuilt in Classicist style. Veltrusy Chateau features nice garden and large park with romantic buildings. During your visit, you can see a number of animals in the park such as deer and others. 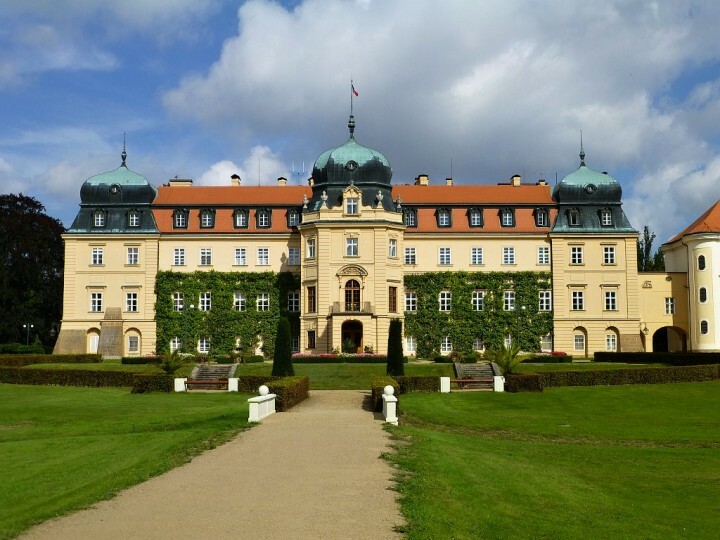 If you want to see how official summer residence of the Czech presidents looks like, then you must visit Lány Chateau. 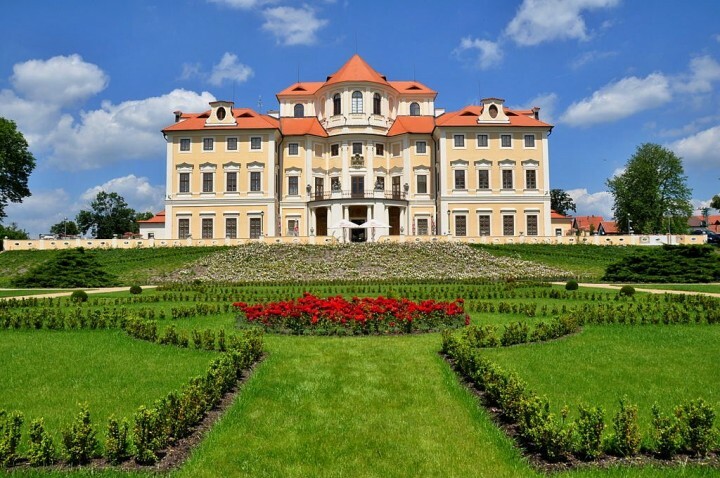 This Baroque chateau can be found in the village Lány not far from Prague and is closed to the public. You can, however, visit the large park with pond and fountain as well as the old greenhouse. Pernštejn Castle is one of the most beautiful castles in the country and is proudly also one of the most visited attractions in the area. It is said that this castle which was founded in the 13th century has never been conquered. 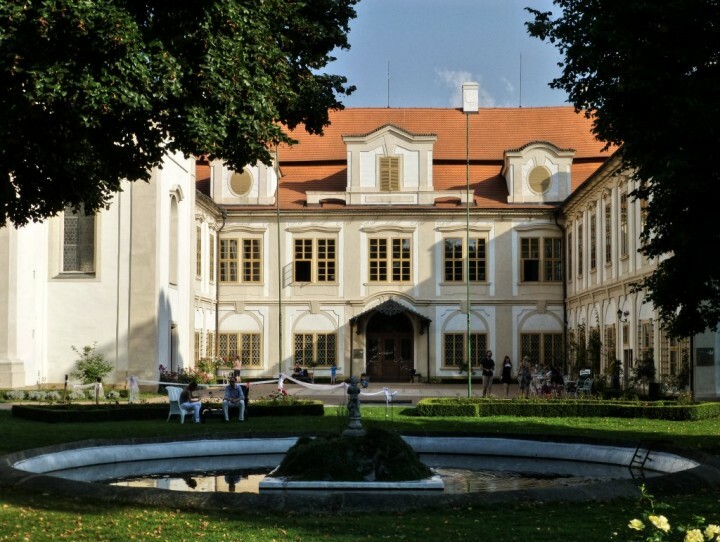 Kroměříž Archbishop’s Palace served as a summer residence of the Archbishops of Olomouc in the past. This UNESCO Site is located in the picturesque town of Kroměříž and boasts gallery and an extensive library. Its halls are regarded as one of the most beautiful Rococo interiors in the Czech Republic and were used as a setting for Milos Forman’s movie Amadeus. Adjacent to the palace is an amazing and large garden with a mini zoo. Křivoklát Castle is a representative seat of the Czech kings and one of the most important and oldest royal castles in the Czech Republic. It contains many valuable late Gothic rooms, of which the most important one is the chapel with a painted altar. Its amazing library contains more than 50,000 books and documents and you can also visit the torture chamber and prison. 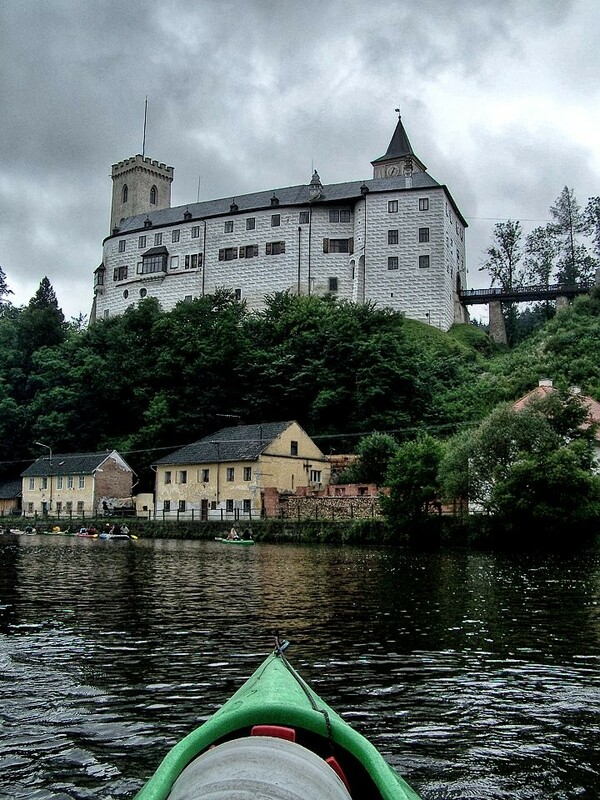 Rožmberk Castle dates from the 13th century and is one of the main sights along the Vltava river, which is very popular among rafters. 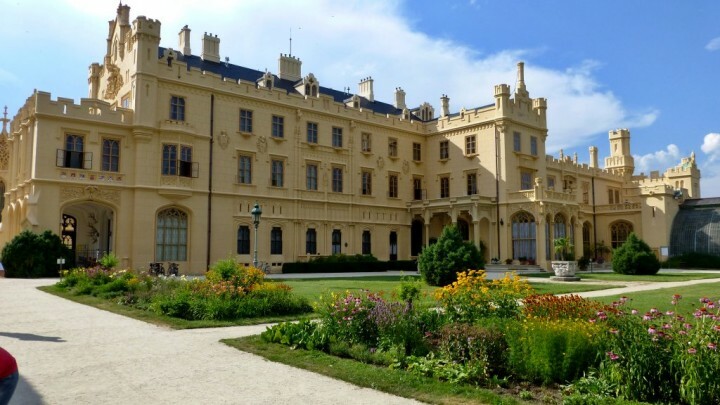 Several prominent Czech noble families owned this castle throughout centuries and now you can learn about their lives in the castle museum. While Prague Castle is the most visited attraction in the country, the second most visited attraction is Prague ZOO. 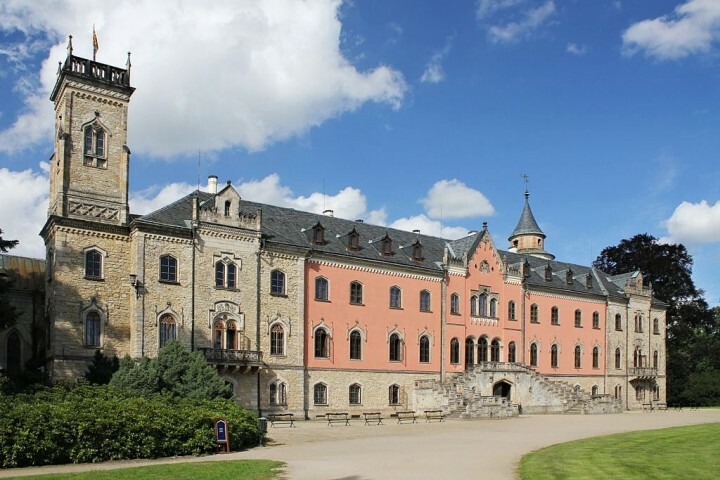 And right next to the zoo’s main entrance, you can find Troja Chateau. 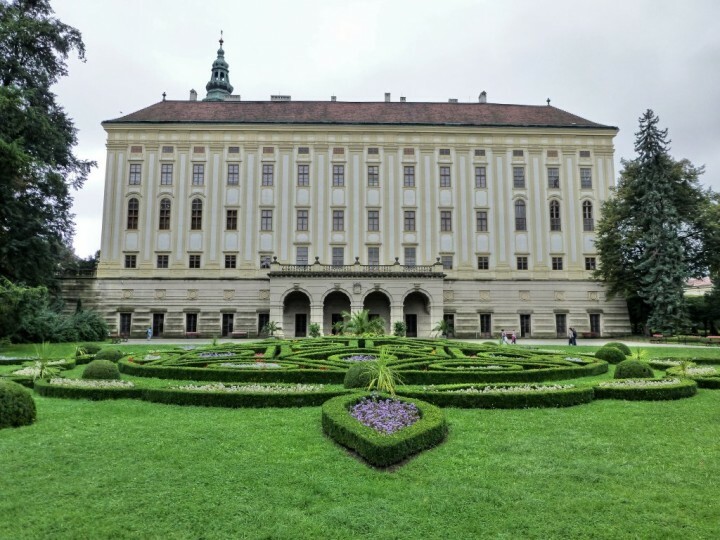 It is often overlooked due to this fact but you really shouldn’t miss this Baroque palace and its gardens. Once here, reserve half an hour for exploring this zoo’s neighbour. Brandýs nad Labem is a small town north of Prague but has a very nice Chateau in its centre. 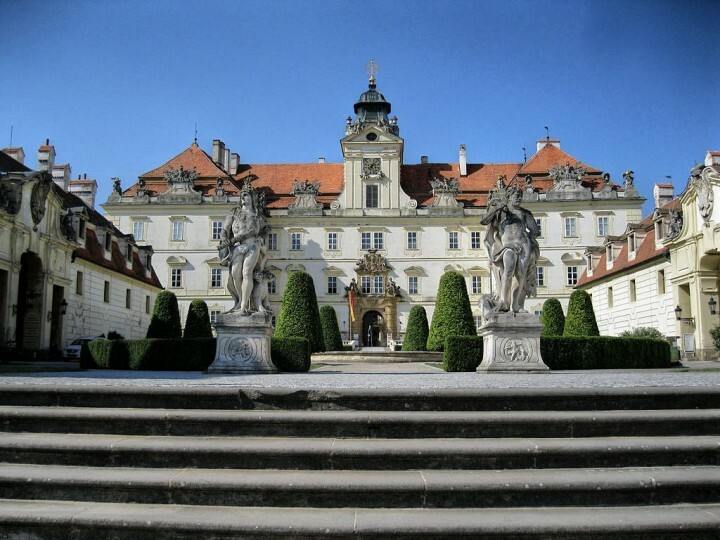 Brandýs nad Labem Chateau was the favourite residence of the Habsburg rulers. It is an important Renaissance monument with preserved graffito decorations now open to the public as a museum. Liblice Chateau is a Baroque chateau built between 1699 and 1706. Recently renovated chateau is now a luxury 4-star hotel with renowned restaurant and first class conference hall. Its gardens are open to the public for free and the chateau tours are available every Sunday only. Průhonice Chateau is a nice place to visit if you are in Prague, as it is just 3 kilometres from Prague borders and you can get here by a regular public transport system (take a bus from Opatov metro station). The castle boasts a large park with the botanical garden, nice lake, and even some waterfalls. 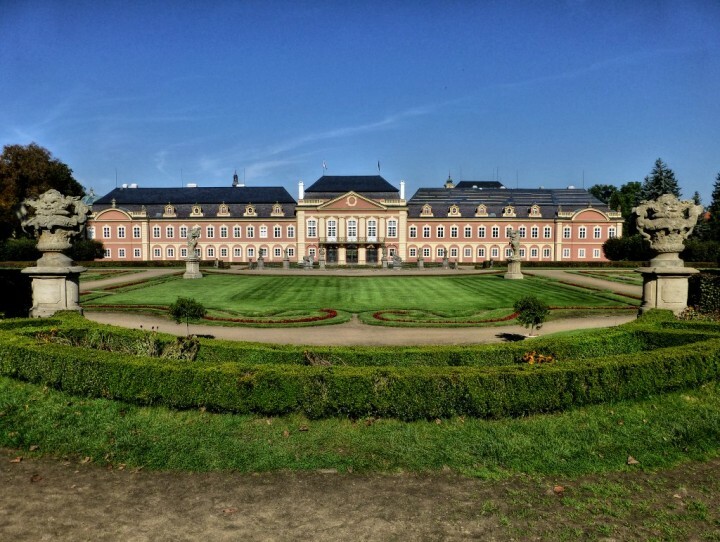 Here you can learn more about Průhonice Chateau and its large park. The former keep from the 15th century was later rebuilt into a late Renaissance chateau and gained neo-Gothic additions in the 19th century. It belonged to many families and also served as a school hostel. Dub u Prachatic Chateau is now in private hands and you can visit its gardens and interior every day all year round. Or you can take a part in events such as concerts, gazebos, competitions or various exhibitions that are regularly held here. Or do you plan weddings? You are welcomed as well! 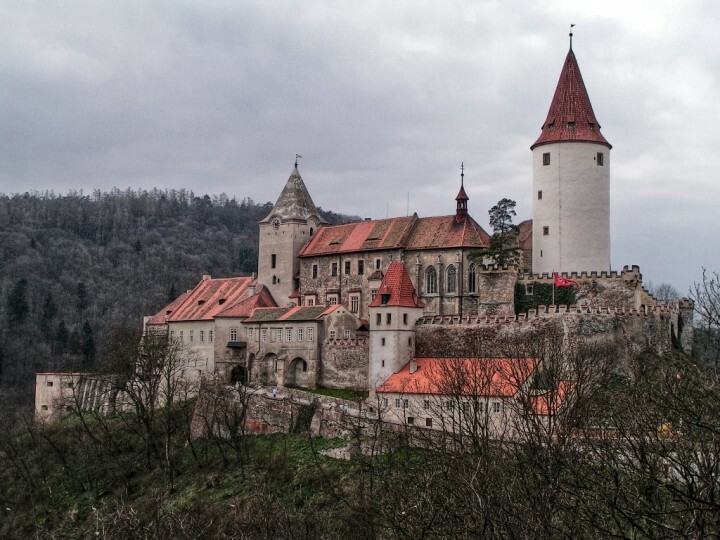 Dětenice village is known in the country thanks to its medieval adventure restaurant but it is also home to Dětenice Château. It is quite a large complex and includes brewery with a medieval tavern, hotel Rustikal and stables, which is currently a home to 45 horses. Don’t worry, it’s not the end! I stumbleupon on a daily basis. It’s always exciting to read content from other writers and practice something from their web sites. excellent web site! 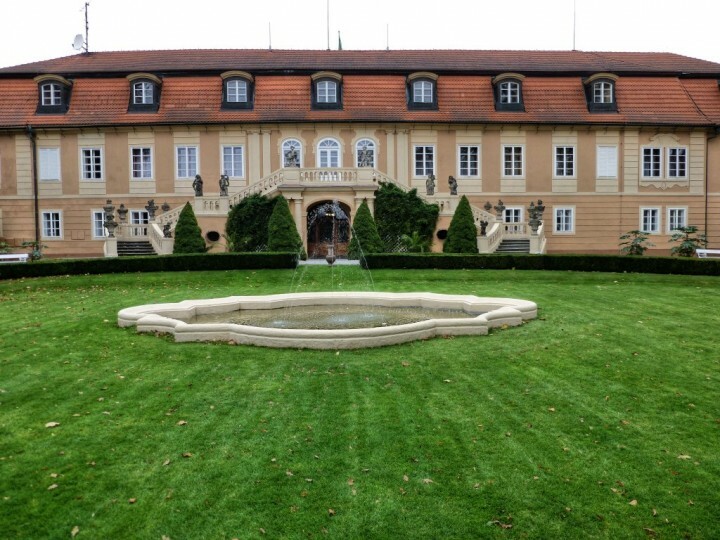 I also recommend chateau Velke Losiny, it is a great chateau with an interesting history! 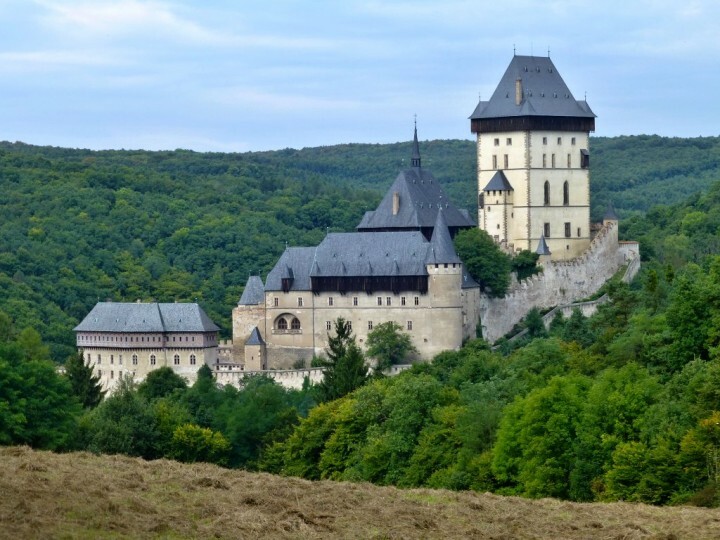 I would also sugest castle Žerotin in Novy Jičin, castle Žerotin in Valašske Meziriči, burg Štramberk, burg Cimburk, burg Slezskoostravian in Ostrava (or burg is not in this topic?). I have visited all of this suggested. There are castles in Malenovice, Zlin, Chropyne and Napajedla. I was in Czech Republic last year and want to go again. This website is a good place to prepare for my next visit. Thank you, Jana. They all are wonderful and will be added on the list soon! 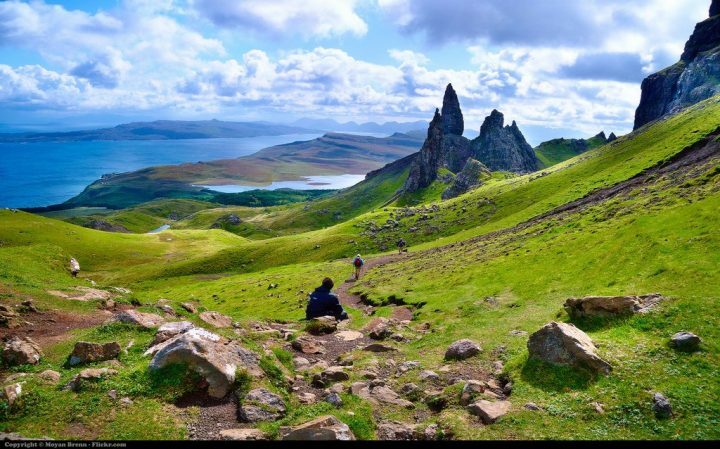 A fairy-tale country! Hi Jana, I have just added all the castles you mentioned here! Thank you for the tips they are really great! Great tip, Petr, thank you! So I have just added Landštejn castle here as well! Amazing list! Agreed! That’s really unique! Seems to be really a smart nation! Julius, thank you for this list. I am from Doudleby nad Orlici and was born in Rychnov nad Kneznou. I now live in Chicago. This is an awesome list. My 12 year old son loves castles and I am very much looking forward to exploring many of these with him. Your list is a great resource. Petr, I am happy that you liked it. I was living 8 years in Prague and always wanted to create such list because all the Czech castles are really amazing! Your son will love them! Thank you, Dali, Czechia is really a country of castles! Thank you, Hanka, do you have some great picture of that Silesian-Ostrava Castle which I could use here in this post? Another great wedding venue 🙂 Thank you for commenting, Tony! wow!! it’s like really wow!!! i’ve never seen castles as beautiful as these, never knew that there are more and a lot to see in Czech Republic.. truly inspiring!!! Wow! What a great list. I absolutely love European castles. I went to Prague Castle for the first time last year. Next time, I need to check out more around the rest of the country. Yes, the Prague Castle is really beautiful, but there are more even more beautiful in the Czech Republic! That’s definitely the most castles I’ve seen in one article! I’ve only been to Prague, need to get back to the Czech Republic! I am starting to believe that this list will never be complete! Not for this country! 🙂 Amazing how many great castles are there! I will add this castle here as well! Thanks, Katy! Oh my! Who would’ve think? Is a lifetime enough for all these? 2,3,13,27 were my picks but then I stopped counting ? Thank You! What about Divci Kamen in South Bohemia, near to Cesky Krumlov. Thanks Souzi, will add this one as well. I can remember this castle very well from our rafting experience on Vltava river some 7 years ago. Just below the castle is the last camping that we missed on our way. There we were supposed to meet with our friends who were in front. But friends were not waiting for us there at the river as agreed and were already preparing tents for night. We thought there is another camping nearby so we floated further. But it wasn’t! Thanks, you are making a beautiful thing!!! I wondered where my Czech mother in law went in late April. 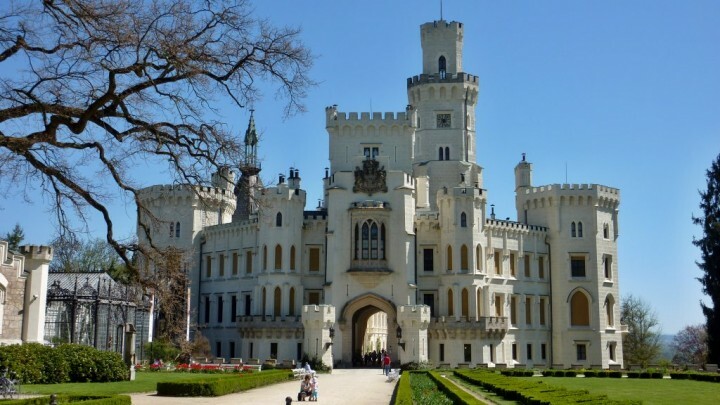 Hi Kajka, I’ve been to Trosky and have this one already on “waiting” list but never heard of other castles you mentioned, but they all look fabulous and will appear here shortly! 🙂 Thanks for your tips! Julius, Kunětická Hora is lovely, it sticks out from plain on a piece of rock – feel free to contact me I have some superb shots if you like. Buchlov Castle is there as well! Number 53! Hello, Buchlov castle (http://www.czechtourism.com/c/buchlov-castle/) is not the same as Buchlovice chateau (http://www.czechtourism.com/c/buchlovice-chateau/). They are close to each other though. Both are worth visiting. What a dumb mistake!!! Thank you, Petr, for letting me know. As a Slovak working in Prague, I was travelling through Buchlovice quite often in the past but never stopped here (another mistake). Next time I’ll do so and make a visit to both of them for sure! I already visited around 30 castles in the Czech Republic and it was always an amazing experience. 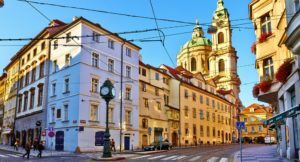 This is why I decided to prepare such list and I couldn’t do a better thing as I learnt a lot and found additional places to travel in the Czech Republic! 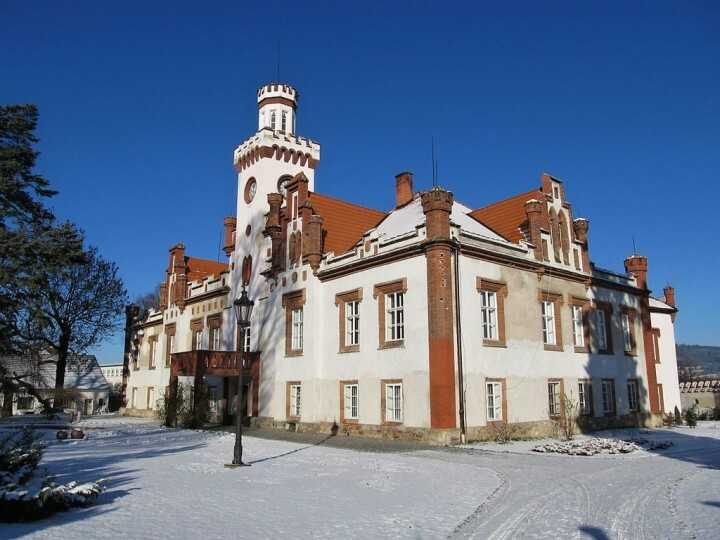 I love Orlik castle. It’s position on the river is just stunning. Here are links to a few others you might want to consider adding to your list. Oh wow – this is an awesome list. I’ve only seen the Prague one (and maybe some others too but it’s been too long to remember) but most of the other look awesome, too. This part of Europe is a place I’d love to explore more in the future so will definitely keep this post in mind! Please add Helfštýn Castle at Týn nad Bečvou, beside the narrowest part of the Moravian Gate. 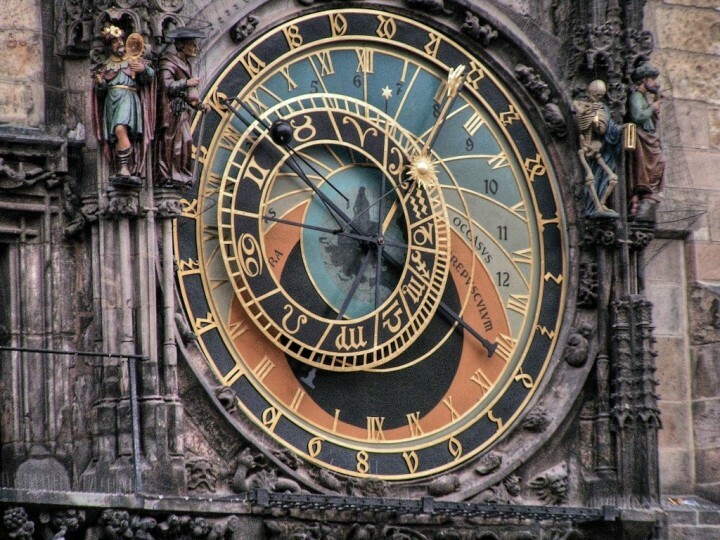 From 1300 to 1700 it was steadily expanded, then fell into ruins, and now is partially but extensively reconstructed. It is comparable in area and ramparts to Rabí Castle above. 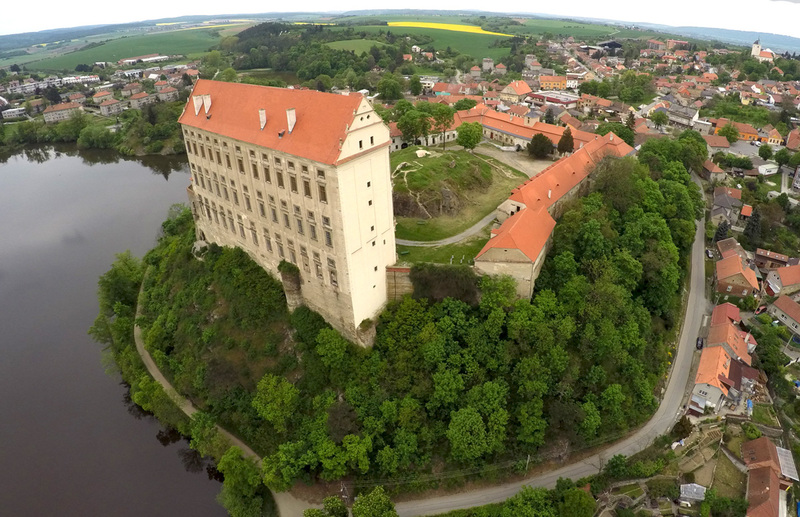 It originally served as the small castle of a marauding knight, then as the home of many famous families, an unconquered redoubt of the Hussites, and against the Swedes and Danes in the Thirty Years War. Its final expansion prepared it to defend Moravia against Turks like those turned back at the gates of Vienna. The Moravian Gate is a low (altitude 331 m) passage between the much higher and more rugged Bohemian Massif and the West Carpathians. About 15 km away on route 647 there is a monument marking the water-divide between the Becvou – Morava – Danube southbound rivers, and the Oder northbound river, which goes all the way to the Baltic. Those rivers originate in the mountains on opposite sides of the Gate, and are of considerable size as they pass within about 15 km of each other over a slight hill forming a barrier. In Roman and probably pre-Roman times this was the “Amber Road”. Amber (fossilized pine resin) washed up on the shore of the Baltic from the erosion of extensive deposits, and was so commonplace that it was burned as fuel. In Southern Europe it was polished and highly prized as rare decorations. Somehow the Egyptian King Tutankhamen, a thousand years before the Romans, got amber to decorate his shield. That probably came from much rarer origins along the Mediterranean. Thanks William for the most valuable comment on my site so far 🙂 I will add this castle as well! I just added 20 more so from the former 55 the list now boats amazing 75 chateaux and castles! I have only been to Prague, but after seeing these places I’ll definitely come back to see other places. Thank you for sharing! There is really so much to see in Czech Republic. This post couldn’t have come at a better time! We’re off to Prague next month, and already a bit bummed that some of the castles will be shut for the season, but there’s just so many more to check out now! Thank you!! Thanks Petra, very nice castle, didn’t know about it. I will add it! 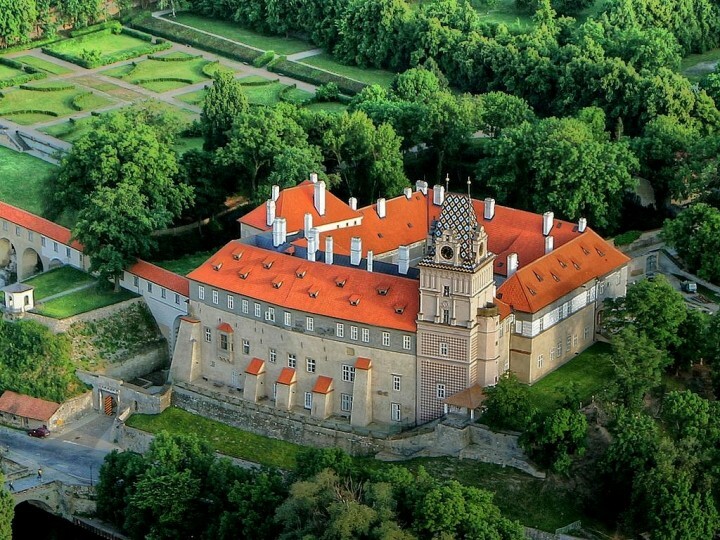 How does Orlik Castle stand up to these “most beautiful”? You’re right, good point! Orlik Castle should really be here! I will add it soon!